School kids always look forward to those lazy days in class where the prime authoritative figure wasn’t there and, instead, a substitute teacher became more of a target than a teacher. It is not very often that we see a movie through the eyes of the sub, so it’s kind of refreshing to know that “Detachment” is taking on that task. Most school-based films, I find, are a general outreach, public service announcement. We start with a class of outcast students that society has given up on due to social and economical deformities and then in rides a new teacher on a white horse to save the day. It’s not that I don’t enjoy these movies, but it is kind of hard to turn an eye on the redundant nature and somewhat politically incorrect format. I’m hoping “Detachment” brings to the table something different and I have a strong feeling that it will absolutely do that. Blazing hot on the festival circuit, “Detachment” is beyond promising. Winning various awards at numerous festivals, there is obviously something to be enjoyed here. Festival wins include Official Selection at the 2011 Tribeca Film Festival, Closing Night Film at the Woodstock Film Festival, and the Valenciennes Film Festival Grand Prize for Best Picture. Starring Academy Award-winner Adrien Brody as Henry, “Detachment” follows several weeks in his footsteps as a substitute teacher. Henry has turned to substitute teaching as a form of self preservation. By not being a permanent fixture in the lives of students, he can’t become attached. It’s a defense mechanism that only works if one can truly remain detached from their surroundings, and, my guess is, there wouldn’t be need for a film if our hero didn’t attach to something or someone to motivate him. The film is based around a strong ensemble cast, which includes James Caan, Christina Hendricks, Lucy Liu, Marcia Gay Harden and Blythe Danner. I can’t wait to see “Detachment” purely based on the festival achievements. Brody’s performance is said to be award-worthy and so is the direction by Tony Kaye, who directed “American History X.” With a limited release date of March 16 in the US, I am anxious to find a theatre in my area that will be playing this. I think there is a gem here but I do warn that this is not a feel-good movie — and I’m told it may, in fact, be hard to swallow. 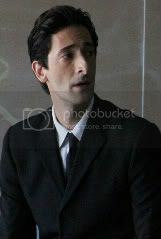 Adrien Brody takes it away – looks good!